You may not have noticed it - it hasn't been publicised very much - but something quite extraordinary happened today. Cape Canaveral, FL – Today, SpaceX became the first commercial company in history to re-enter a spacecraft from low-Earth orbit. This marks the first time a commercial company has successfully recovered a spacecraft reentering from low-Earth orbit. It is a feat performed by only six nations or government agencies: the United States, Russia, China, Japan, India, and the European Space Agency. SpaceKSC has an excellent list of news stories on this event. While the June launch was to demonstrate the ability of the Falcon 9 launcher, today's flight was to validate the design of the Dragon itself. The mission goals were to show its ability to maneuver in space; deploy a cluster of small satellites, called "cubesats"; orient itself for atmospheric entry; perform the deorbit burn; survive entry into the atmosphere at the designated g-levels (it has to eventually be capable of returning passengers from orbit); deploy parachutes; and hit the ocean at the specified speed to allow intact recovery. This success clears the way for the next demonstration flight in the next few months, which will demonstrate the ability to perform a mission of longer duration, with the addition of solar panels (today's flight had batteries only), and to perform a rendezvous and match orbits with the ISS. Then there will be a follow-on demonstration to actually dock to the ISS, which will essentially certify the vehicle for cargo delivery and return, reducing the need to purchase such services from the Russians, with the retirement of the space shuttle next year. The Falcon 9 cost $600 million to develop. To continue development of the Dragon spacecraft so it's man-rated, perhaps another $400 million. There is another cost though. 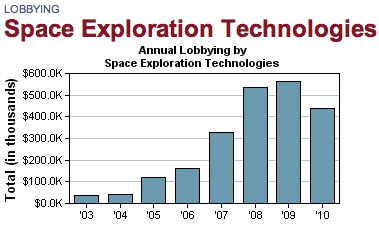 While NASA as a government agency is slave to the pork-barrel, private companies have to pay the devil his due. Between January 2009 and Nov. 22, the date of SpaceX PAC's most recent federal report, the group has raised more than $60,000. And more than 20 federal-level political candidates have received campaign contributions from SpaceX PAC this election cycle through the second quarter of 2010. Democrats dominate the list of the PAC's beneficiaries, with Sen. Barbara Mikulski (D-Md.) and Reps. Jane Harman (D-Calif.) and Chet Edwards (D-Texas) receiving the most cash through the middle of this year. The SpaceX PAC also this cycle made four-figure contributions to the National Republican Senatorial Committee and the Nevada State Democratic Party. Small beer. US Politicians are cheap. But it's still an additional tax on doing business.